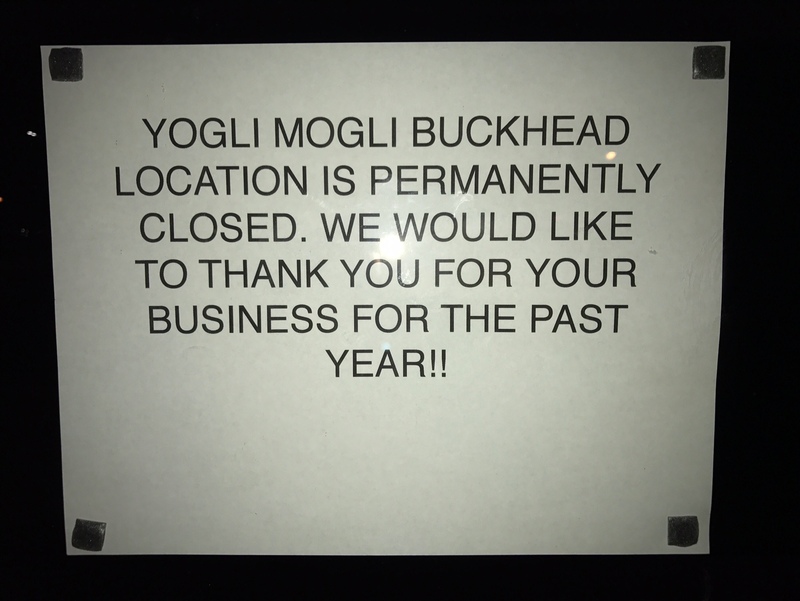 Yogli Mogli has closed their location at Lenox Village on Lenox Road in Buckhead. The shop, which opened in late 2011, was one of many FroYo joints that popped up during the dessert's peak of popularity. The Lenox Village location, which readers report had been operating under very odd hours for the past few months, reportedly closed at the end of July. The shop had changed ownership and management at least once since opening, and many in the community were seemingly fans of the changes, both in price and service, that were introduced under the most recent management. Readers report being charged as much as 90 cents an ounce for yogurt, while others claim they were charged as little as nine cents. Most froyo shops in Atlanta charged about 45-55 cents these days, so this location seemed to own both extremes. The Yogi Mogli in Lenox Village was approximately 1,900 square feet. The center was built in 1989 and is most famous for being home to Roasters, a popular chicken restaurant. Vine & Tap, a tapas and wine bar, closed this past April, while Mae's Bakery was sold in May but continues to operate largely the same. The center's leasing was previously handled by local agents with Atlanta's The Shopping Center Group. 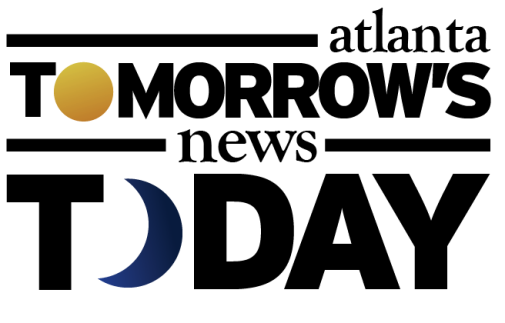 Today, leasing seems to be handled by Rivercrest Realty Investors and an agent and property manager based in Raleigh, North Carolina. While there is no doubt this center is a challenge, having an out-of-state agent and property manager would seem to make the challenge that much more difficult. Yogli Mogli continues to operate thirteen locations in Georgia and a single location in Niles, Illinois. Last year, Yogli Mogli was evicted from their location in Emory Village near Emory University. This past January, Keba Sandwiches, an Athens-based Mediterranean quick serve restaurant, opened in its place. 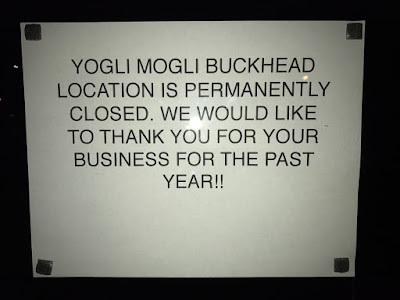 Other local Yogli Mogli shops have previously closed on Windward Parkway in Milton and on State Bridge Road in Alpharetta. Yogli Mogli is an Atlanta-based business developed by serial entrepreneur Roi Shlomo. Shlomo opened the first Yogli Mogli in 2009 near the corner of Abernathy and Roswell Roads at Abernathy Square in Sandy Springs. In 2013, with over a dozen locations across five states, Shlomo sold Yogli Mogli to Durango, Colorado-based U-Swirl, a competing frozen yogurt business. That same year, Shlomo launched Kale Me Crazy, a juice bar concept (that has more recently added poke to its menu), in Inman Park. Today there are nine Kale Me Crazy locations open in Georgia, with a single unit open in Cary, North Carolina, and a pair of new locations in the pipeline for West Cobb and the Larkin on Memorial project in Grant Park. Are you surprised that Yogli Mogli closed their Lenox Village location? Had you experienced the inconsistent and unpredictable hours and pricing at the Buckhead location?  What would you like to see open in place of Yogli Mogli and or Vine & Tap? I am not surprised, as this Yogli was very infrequently opened and had so few customers when it was. The plaza clearly has major struggles. As a long time neighbor, I am struggling with what I would put in that plaza that would work...Mae's is great but no one even knows its there, there was a pizza place but that closed, boutiques seem to go unnoticed...I'm thinking that the plaza needs something tried and true (at least for the times)...Orange Theory? Kale Me Crazy? Breakfast place perhaps? Make it all office and institution. The botox clinic etc have been there for almost 20 years. nail salon has been there 25 years too and no more fitness as there is not any parking! Sushi has been there for 10 years also.